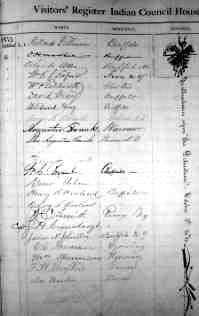 A page from one of the Visitor Registers. The top signature is President Millard Fillmore, the fifth one from the top is William Pryor Letchworth. This page is from the 1872 "Last Council Fire" held at the re-dedication of the Council House. If you had visited the Glen Iris during Mr. Letchworth's time, you would have probably signed your name in the "Visitors' Register Indian Council House". This series of books recorded the names, locations, and comments of those who journeyed to the Council Grounds. Today these books are housed in the William Pryor Letchworth Museum collections. We offer you the chance to participate in this old tradition but in a modern way! Using the link below, you can send a message to "Letchworth Park History.com" We appreciate any comments, suggestions, and of course, questions you may have. We try to acknowledge everyone who registers! As part of Letchworth Park's upcoming 100th year anniversay celebration, we collected "Centennial Memories" as a way of wishing "happy birthday" to Letchworth State Park . A Centennial Memory consisted of a special memory from your experiences at Letchworth Park. It could be a story about your first visit or an adventure that you or you family had at the Park. For more information go to our Letchworth Park Centennial Page If you are sending a Centennial Memory, please put "Memory" in the heading of the email. Although the official centennial has added, we will continue to add them to our site! Please note : If you are wondering what happened to the old guestbook form - it fell prey to a spammer who loves to fill guestbooks with links to sites. We were just overloaded with the spam entries. Since we enjoy hearing from our visitors, we decided to try the Visitors Register in a different way!